This sculpture features in the exhibition, Australia: Defending the Oceans, at the Oceanographic Museum of Monaco. 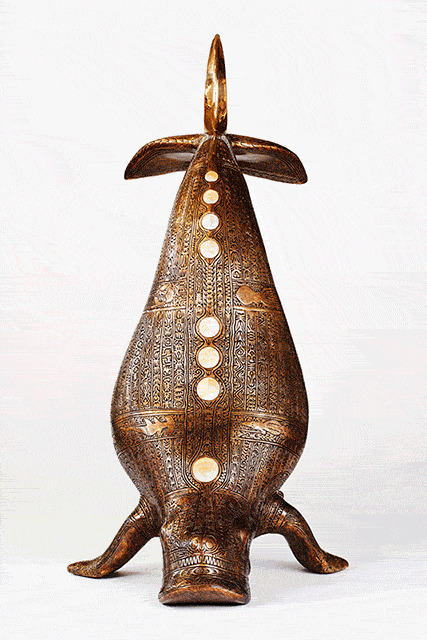 The work represents a dugong swimming in the moonlight. It is in a position called San Tidayk, which is when the mammal flips its tail in order to dive down to the sea grass beds on which it grazes. The incised patterning on the body of the dugong relates to the destruction of the sea grass beds caused mainly by large vessels which force not only dugongs from their feeding grounds but also other sea creatures such as rays, crabs and crayfish.